Most had never met her but were moved by the tragic death of the girl whose body was discarded on a hillside. HACIENDA HEIGHTS, Calif.— Most had never met her, didn't even know her name until they saw it on the news. 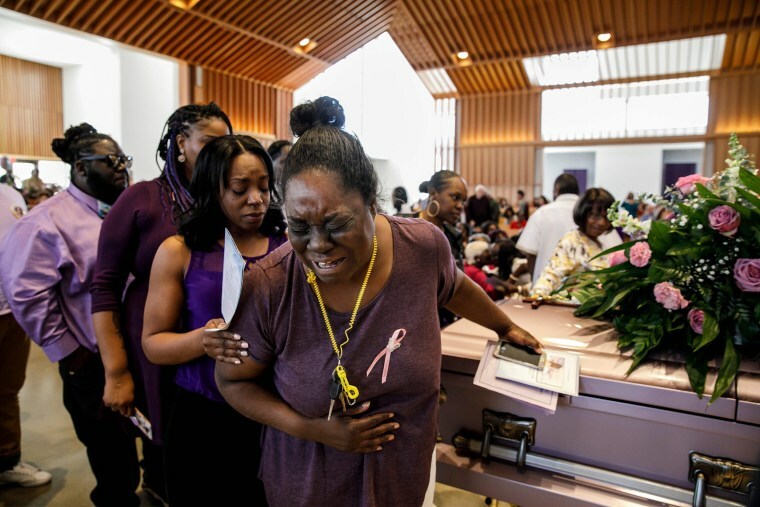 But moved by the tragic death of a 9-year-old girl whose body was found stuffed into a duffel bag and discarded on a hillside trail — like so much trash, as one mourner put it — people turned out by the hundreds Monday for an at-times joyous, at other times angry and frustrated interfaith service celebrating the life of Trinity Love Jones. They all but filled the pews of spacious St. John Vianney Catholic Church in the Los Angeles suburb of Hacienda Heights, just a couple of miles from where a park worker had found Trinity's body on March 5. She was dressed in pants with a panda pattern and a pink shirt — her favorite color — that proclaimed, "Future Princess Hero." Her mother and her mother's boyfriend have been charged with murder. "I don't even know them but I just had to come. I have grandchildren her age," Camille Boswell of the nearby city of Placentia said of Trinity and her family. "Any time a ... child dies, it hurts." Following the wishes of Trinity's father, Antonio, she had arrived in a bright blue and white suit and bright blue hat because Trinity liked bright colors. Other mourners wore buttons with her name and photo on them. Many acknowledged they had no idea who she was when her body was found on March 5, but they followed the news daily, stunned that such a thing could happen to an innocent 9-year-old. Hacienda Heights, 20 miles east of Los Angeles, is in many ways an insular community of 54,000 people, made up of large numbers of white, Latino and Asian residents. It's walled off on two sides by hillsides dotted with large homes that offer stunning views. In the center are rows and rows of neatly kept 1960s-era tract homes. As word of Trinity's death spread across the city through social media, local resident Kara Clark said people felt they had to do something to show their respects to her family and to also make it clear they are fed up with a society gripped by such wanton violence. "When we first heard what happened to this child my first thought was that it could have been my granddaughter," she said. "Enough is enough with all of this stuff that happens in our world — it's awful." Soon after the service began at noon on a warm, sun-splashed day on the church's outdoor plaza, six pallbearers, including Trinity's father, emerged dressed in matching white suits with pink vests to usher her tiny coffin inside. At the altar was a pink teddy bear and balloon. Behind it was a 9-foot-tall photo of Trinity smiling shyly and dressed in a leopard-print outfit. "It is so fitting that we are underneath this bright sun, because what we celebrate today is the light that Trinity has within, the eternal light that has not been extinguished," Father Egren Gomez told mourners before leading them into the sanctuary. Before going inside, mourners saw 90 candles lighted in honor of Trinity's life — 10 for each of her nine years — and heard the church's bells toll for 90 seconds. Inside, her life was celebrated with songs and eulogies from a cross-section of religious leaders, including Catholic priest Gomez, Pastor Darnell Hammock of the New Life Community Church of Oakland and Venerable Miao Hsi, a nun from the nearby Hsi Lai Buddhist Temple, near where Trinity's body was found. The fieriest eulogy came from Hammock, who acknowledged that although Trinity's murder had brought people of all faiths together, he realized many would leave wondering why it had happened. "I got to be honest, church, I too wrestled with these questions as I prepared today," he said, adding her death reminded him of those of numerous other young people snuffed out before their time. "I'm here to ask myself, 'When do we change the channel of this alarming episode of young black girls dying?'" he shouted, an exhortation that brought the largely white audience to its feet. But he went on to tell mourners not to pass the chance to work together going forward. "I want the community here today to embrace this outlook that we are in this together," he said. Miao Hsi added that Buddhist faith accepts that although Trinity is gone, her spirit lives on in every person she leaves behind. "We are here to celebrate Miss Trinity's rebirth," she said. "May she feel love, joy and peace."